Ramblin' Man Dan – Page 6 – A blog about my adventures of living on the road! 1. I want to empower people to make better decisions that benefit us all, and I do that with knowledge. Knowledge is power! 2. I like helping people, and fixing things, both in that order, and that combination. I don’t like to ‘toot my own horn’, but I would like to give you a little background on me so I can present my information in a transparent fashion. Where you take it and what you do with it is completely up to you! Facts. These are pieces of information that are known to be true and accurate, and i’ll provide links and/or references so you can see for yourself why I believe it’s a fact. Lessons Learned. These are pieces of information i’ve figured out myself, usually by trial or trouble, and I am passing them on to you, for whatever they may be worth to you. My opinion. These are pieces of information that are not facts, but are my opinion, which come from research, thought, and more research. Take them for what they’re worth to you, and feel free to throw them right out the window if you like. A grocery store bagger, cashier, and service clerk. A dishwasher, short order cook, grill cook, expediter, server, waiter, and host at several restaurants. A contractors helper, then a handyman, then a contractor, with a total of ten years experience in construction. A bike shop wrench (sales, service, repair, fitting, ….) for four years. A commercial truck driver for two years. (Yeah, I can roll big wheels, float gears, and back that baby up). I use the experience i’ve gained from those jobs, along with my natural problem solving ability, and my desire to make things better, to bring you posts that answer questions, provide useful directions, and empower you, my reader, to do more. I’m not better or worse than anyone else, but I do push myself to be a better version of me every day. Let’s talk about trailer tires! Not long after I bought my TT, I had a tire blowout, which set me down the path of searching for new tires. I’ve been around, and working on, automobiles for a long time, so I figured this would be no big deal, right? Well, kinda. Tires are a critical component to your RV, and they’re often overlooked, which is sad. The rubber that connects your rig with the ground, to me, is the most important rubber on the whole rig! Anytime you want to GO somewhere, you need tires that are ready to roll, so I highly recommend you take some time with your tires, because a great choice made with some education and thought now could save you a lot of time and money later. There’s an awful lot of information out there about tires, and far more options than i’m going to discuss in this one post, but here’s a primer for you based on what I learned in my many hours of research. Tire Types: There’s round ones, and flat ones, right?? According to Tirerack.com (a terrific resource for all things tire related! ), there’s a couple of key factors in tire type. You’ve got types that deal with weather, such as summer, all-season, and winter (usually winter/snow), which all have different tread patterns for dealing with weather. You’ve got tires based on Performance needs, such as street, track, and competition, so if you’re going to take your rig to the track, be sure to look for high-performance tires! A big key for us RVers in tire type is the vehicle designation, such as Light Truck, Special Trailer, or Passenger. The key component to tires is “Tire Specifications”. When selecting tires, there’s several key specs you want to look at, and make sure they match what you need for your rig. (More info here) I need ST225/75 R15 for my trailer, so let’s break that down. Service type (we talked about earlier) is the letter (or letters) at the beginning of the tire size stamped on the tire, and tells you if that tire is designed for a Passenger vehicle (P), Light Truck (LT), or a Trailer (ST). “T” is for Temporary Spare, and you should never run on that any longer than absolutely necessary. Section Width is the first set of numbers after the letter designation, and tells me how wide the tire is, in millimeters. Sidewall Aspect Ratio is the second set of numbers after the slash (/), and tells me the height of the sidewall of the tire in percent. So, my sidewall is 75% of the width, so 168 mm tall. Construction Letter, the next piece of my tire info is the, “R”, which means it’s a Radial tire. More info on tire construction, here. Wheel Size, the last piece of tire size info, tells me the size of wheel it’s designed to fit on. For me, it’s a 15 inch wheel. You should ALWAYS buy tires designed to fit your exact size wheel. ALWAYS. Load Index. 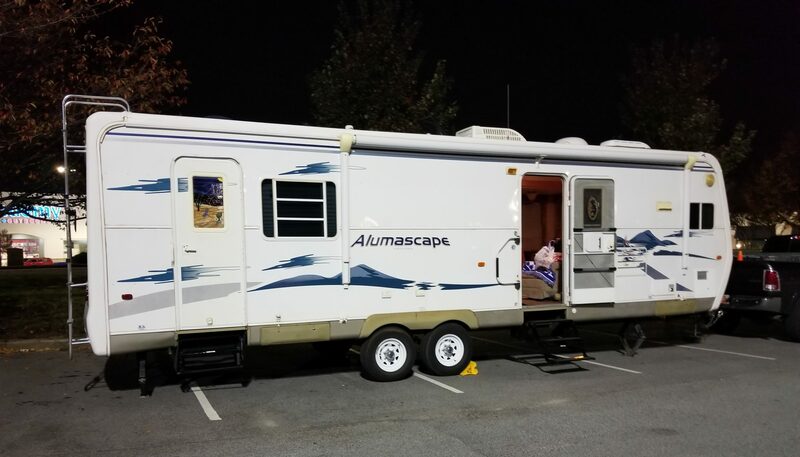 It’s important to note how much weight (or load) your tires need to be able to handle, and this make a BIG difference in RV’s, especially travel trailers! The load index is a numerical designation, separate from the primary size info, and tells you how much weight the tire is built to handle. Keep in mind that number is for that tire, so you’ll need to divide your rigs weight by number of tires to figure out the minimum weight each tire needs to be able to hold. My TT is 11,000 GVWR (Another blog post! ), and if you divide that my four tires on my rig, I need each tire to be rated at 2,750 Lbs, which means I need AT LEAST a Load Index Rating of 116. Speed Rating. Most trailer tires are speed rated at 65 MPH, which is fine for most applications, but I like to have the option of flowing with traffic, or going a little faster when traffic and speed limits allow. Load Range. This is a separate indication from Load Index, and instead of weight, it has to do with the number of plys, or layers, in the tire. My TT calls for Load Range D tires, which are 8 ply, so that’s the minimum tire I would use. One last thing to know: Tire expiration. Yep, your tires really do expire. Not as fast as the milk in your fridge, but it’s important to know that tires expire in six years from manufacture, and should not be sued or mounted after they’re expired. Learn why tires expire in six years. Learn how to read the date codes on tires. I chose to go with tires that exceed all of my required ratings to comply with the “80% rule”, so I have Load Range E tires that can handle 2,830 Lbs each, and allow me to travel up to 81 MPH. The size is still the same as what the manufacturer requires.